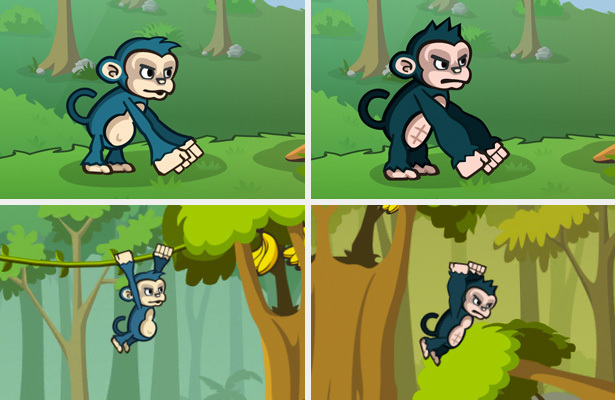 On the picture above you can see how “the Monkey” looks like. Both the normal look and how he looks like after he has been drinking Magic Moonshine and is ready for some melee action. Try to pick a catchy name that capture his personality. If you like a name someone else has already posted, go ahead and write that as well. *The author of the name gives Koloss Interactive full right to the name. A free copy of Lumberwhack will be distributed after the game is fully released for the specific operating system. He likes his moonshine and he’s a forest dweller. His name is of course Lee Bubba. Lee Bubba is a funny name. Artemis – Artemis, the goddess of forests and hills, was worshiped throughout ancient Greece. If your monkey is a female, you can target that market more directly. The introduction of some Greek mythology into your character setting would be a nice touch as well, and it ties in with the suggestion below. Perhaps power-ups could be related to each character’s alter ego – a Greek god of sorts for each. It adds a sense of wonderment to your game’s value proposition, and flavor to your back story, if you like.